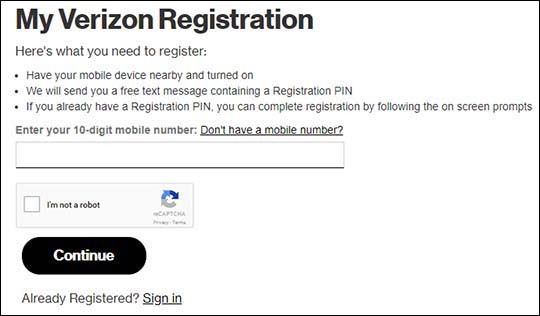 The My Verizon username / 10-digit mobile number and password are used to access all Verizon Wireless portals (e.g., My Verizon, VZ Navigator, etc). To register the 10-digit mobile number of a Jetpack you need to comunícate con Servicio al Cliente para obtener ayuda. Ve a Inscripción en Mi Verizon página. Ingresa el número de móvil de 10 dígitos. Click the I'm not a robot checkbox. If presented, complete the task then click Next. If Account Owner is already registered, click Continue then proceed to Paso 7. Sí, soy el propietario de la cuenta. Soy responsable del pago por la cuenta. No, soy miembro de la cuenta y no la persona responsable del pago por la cuenta. Enter the billing ZIP code. If applicable, enter the account PIN or billing password. Enter your Registration PIN then tap Verify My Account. Must be 6-60 characters and can't contain spaces or match password. Must be at least 8 characters, contain at least 1 number and can't be easily guessed. To continue, click the I accept the Terms & Conditions checkbox. 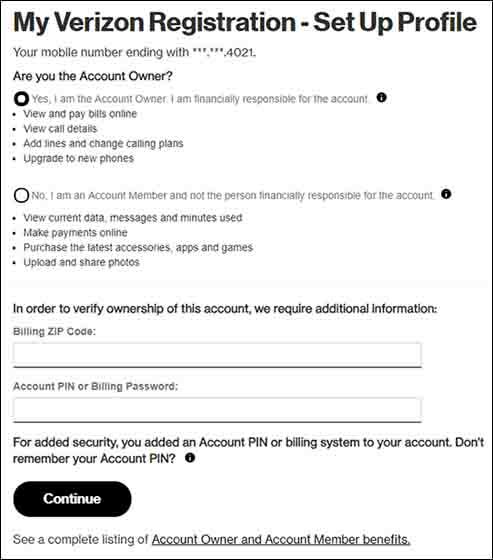 Check out these Preguntas for more info on accessing My Verizon via a web browser.